Well, all temps aside, the calendar says the first day of summer is June 20th, so you've got until midnight 6/20/08 to set some summer knitting goals and enter my little contest. This year's prize will be a kit to make the Simple Raglan, using Blue Sky Alpacas' newest yarn- the Skinny Dyed Cotton (which knits up to a similar gauge as the Hand Spun Organic Cotton that the original was made up in). Pattern, yarn, and a Pretty Cheap Project Bag- new fun stuff from Blue Sky Alpacas!! Yay! Who doesn't love new stuff?! Great kit...love that yarn...mind you, I am addicted to anything by Blue Sky it seems. When I go the the LYS, I have to force myself away from the Blue Sky section. I like the minimalism of that sweater - I seem to gravitate toward those kinds of patterns. I love to plan and I love lists. I just made mine. Well, that post took a long time!!! I love to read everyone's goals though! I am definitely in. It's becoming a tradition! I found you over on Guinifer's site (Halfway Down the Stairs). I'll start thinking about those goals. . . so many . . . so many . . . I've joined the band wagon. Come see my goal! My goal is to do lace--a lace shawl (I've started an easy one)--something intricate and drool worthy!! Thanks for the contest. I really needed to take a realistic look at my "goals" which are, of course, rather unrealistic. Now I'd better get knitting! I've posted my goals. This contest has been very inspiring in terms of setting goals - now I just need to start completing them! Some of the links are a bit on the wonky side . . . The orange sweater looks pretty! Goals are good sometimes...now i am just waiting for summer! we actually had snow on our mtns last night! off to start knitting, listed my goals ! I posted my goals and hopefully I can accomplish them! I don't know for sure how many of my "goals" I can get accomplished, but I'm really going to try. This must be my Summer of Insanity with two contests and a big "move" this summer. I'm in - I need to focus myself definitely! I'm in, thanks for the encouragement! That is a cool feature...:-) Mr Linky... I have to keep that in mind for sure. Thanks for getting me to focus on what needs to be done. By the way, I can guarantee that if I used the yarn for the Simple Raglan sweater, it would never turn out as beautifully as yours. I love your contests! Makes me blog and think about my goals for the summer. And your prizes are THE BEST. You got me hooked on BSA Dyed Cotton from the last contest... can't get enough of it! I made the Mossy Jacket with it (baby jacket) and it's wonderful. Yay! Contests are fun because free things are fun . . .
Love the contest idea! Hope it keeps me motivated this summer! I'm in and linked, thanks...although my major goal right now is to keep yarn flowing through my sweaty fingers here in the approaching 100 degree NYC funky heat. Ok, set some goals. You amaze me with the details of yours! Also, what a cute little quiz... 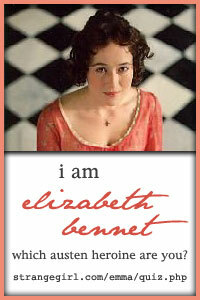 I'm an Eleanor Dashwood. ;) I just watched that movie again Saturday night. I've been Jane Austen obsessed of late. I'm a new knitter and so excited to join this contest! I have taught myself how to knit via the internet and LOVE it! Hi, great comp! I've knitted for a few years, but this is the first year I actually have a list of projects to work through, so your competition is just great for me! Now I hope I can check off the items on my list. I'm in! Here's hoping I reach all of my goals--that would be enough prize for me! Whoo, goals! I think I can do everything I planned...we'll see! :D Great contest, btw--it's fun AND gets us moving! I don't have a blog so I'm probably not eligable, but my goal is to try my first cable project. Lovely sweater. I love that sleeve detail. A summer with goals will be a nice change from my usual summers of waiting for cool weather. Good luck on your goals everyone! I'm in too! Darn Cookie... she leads me down the path of ruin ALL.THE.TIME! I think this is the only way I'll finish my projects! btw i love that orange sweater! I'm a Cookie Follower as well... sigh. Yay! Thanks for holding the contest again this year! I found the contest through Stacey - and although I hate making goals, I'm totally in love with the yarn, pattern, and bag! I commented but used my Blogger account, so it goes to the wrong profile - oops. Anyway, I've set my goals! Thanks for the contest - I love the cute little bag and I love orange! I'm not sure why, since orange is not a good color for me, or for those for whom I knit. But I like the concept a LOT, and thought it'd be fun. Found your contest while blog-hopping - sounds like fun to me! Sufing the knitting blogs, I was delighted to come across your Summer 08 contest and moved to start my own knitting blog. You my find my blog listed as "knitting life". Cool, thanks for the contest. So glad to have found your blog, too. Great contest everyone wins even if they don't get a quote prize from you. Thanks for give us all the needed jump start to get organized fro the summer. I'm posting the contest today. I'm looking forward to a summer of knitting! What a great idea for a contest! I posted my goals today; I kept the list short because I often tend to set too many goals and then get frustrated and it becomes stressful. I'm trying to learn to destress a bit and think I've set some reasonable goals. What an amazingly generous prize you are offering! I'm keeping my fingers crossed for - wait, I won't accomplish my goals with my fingers crossed, now will I? Thanks Ali, I needed a good nudge to get me to commit to a plan. Thanks for this wonderful idea. My goals are posted and I'm focused on my task for summer! I'm in too! Great idea. Can't wait to start. Thanks for the kick in the yarn basket! Can't wait to show you a pic of all the socks I've knit at the end of the summer. I am so in! I just posted my goals and am ready to achieve them along with everyone else taking part in this fun! After posting (and looking back on) a spring set of goals, I had to seriously scale back my summer ones. But I think that's OK, and since I live by lists, I'll be excited to cross lots off of mine. Thanks for holding the contest! I posted my goals. Now hopefully I'll accomplish them. What a great idea! I hope this helps me keep to my knitting during the hot Florida summer! I set myself a lot of goals but it's my incentive to finish those WIPs lying around all over the place. I'll probably treat myself to something nice each time I achieve a goal, like a book just to keep me going. Maybe I'll do better at meeting my goals this time. I'm working on it anyways! Goals are done! Thanks for having the contest, it made me set them!! Your knitting goals contest seems like a lovely idea. I'm in. Thanks for the kick in the pants...If I get through even half of my goals, I'll feel quite accomplished! Thanks for the contest! I needed a reminder that the solstice is tomorrow and then it is actually summer and time to start knitting. Lovely blog, btw! Cookie, Stacey, and Joan made me sign up. Thanks for helping me set some goals. I'm in! Just barely, but in. :) Even just posting the goals helped me get organized--thanks! i'm just barely in too! my goals for the summer are soley focused on socks. is this ok? Now, the list is written - I'd better get knittin'. Not sure if I"m too late... but I posted my goals and your contest. Great idea! Hope your accepting late entries, but either way, had fun! I really love that color. I can't wait to see it all finished up and pretty. Happy knitting!